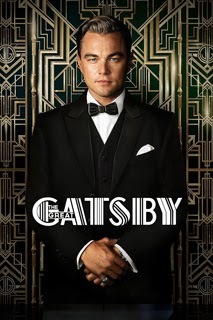 I finally watched the 2013 release of The Great Gatsby last night on my birthday. When I saw that the film was coming out a while back I picked up the book and gave it a second read. I remember thinking it was pretty good in high school, especially compared to the novels we were forced to read in those formative years. My second read showed me why it, along with another favorite novel The Adventures of Huckleberry Finn, is called the great American novel. I love the novel. It is amazing. It's prose is like a rich dessert that you want to come back to again later for its deeply subtle taste that’s so nuanced and delicate. You can read the review of the novel I wrote after reading it a second time through here. Now on to my review of the movie. At first I did not like it at all. I was pretty disappointed. It was just a bit too flashy and theatrical. It seemed a bit over the top, Almost cheesy. That's kind of how most of Baz Luhrmann's film seem to me at first though, and then I fall in love with them. Romeo + Juliet had the same effect on me. It's just so different that it takes a while for you to "get it." Once I do his films have their own kind of brilliance that I love. The Moulin Rouge! was a fantastic film. I love the songs in that one. So by the end of the film I liked it. I remember the moment now when it changed for me. When Tom hits Myrtle it snaps into slow motion and you see Nick Carraway retreat on to the balcony in an attempt to get away from it all and the camera zooms out insanely fast onto the whole city and you finally feel like you're there with Nick and you get it and everything makes sense... at least that's how it was for me. You don't really see much of Gatsby, brilliantly played by Leonardo Dicaprio, until a while after that. 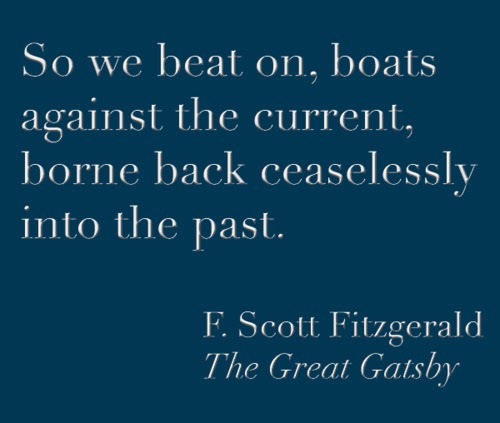 I had a feeling that once Gatsby was on screen I would start to like the film. I was right. You don't see much of Gatsby in the beginning of the story in the novel either, so it was fitting but it seemed to take forever to finally get to met him in the movie. One thing this movie does well is capture the novel faithfully in it's own way. I don't recall any major plot points or events being changed. 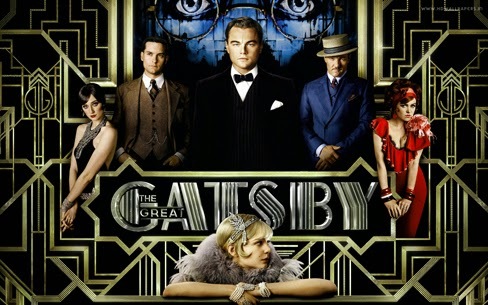 Other than some of the modern music Baz Luhrmann chose to use I finally felt like I was watching the book. The further into the movie I got the more I felt it did an amazing job at capturing many of the moments in the book. Seeing Gatsby reach out for the green light. 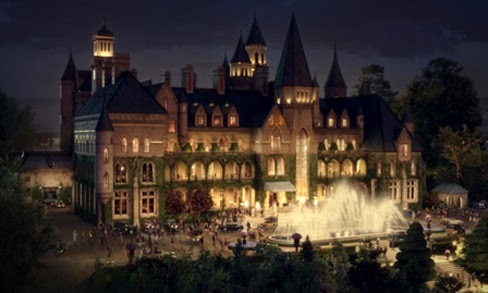 Seeing Gatsby finally have tea with Daisy and then show her his mansion. From that point on I was in and I really enjoyed it. Much like the book the movie haunts you for a while after you watch it. They did a good job leaving you with the same feeling you get when finishing the book. I'm glad they put in that last line from the novel I found in a nice graphic image here. So good. All in all by the end of the film I really liked it and now I want to watch it again. Maybe I'll end up liking the first act or so this time around. As for the novel if you haven't read it you really should. It's an amazing novel, and quite short so it won't take you that long. If you need more convincing watch this awesome video where John Green describes everything he finds interesting about the novel. Have you seen the film? What about others by Baz Luhrmann? Do you love them hate them? Not get them or think they define eras of time? Chime in with your own thoughts in the comments. I'd love to hear from you, and thanks for stopping by. Well it's my birthday. Did you know Google puts up a custom Birthday graphic on your birthday if you're logged in? Kind of cool. Anyways, I'm 31 today. Depending who I'm hanging out with I'm either really old or still quite young. Either way one thing I know is that I'm very blessed. I have an amazing wife who also happens to be my best friend, and we have three beautiful kids who we really enjoy. I don't deserve the life I get to live. I'm so happy to be married to my wife and be a daddy to my wonderful kids. They are awesome. Life is good. Everyone knows dragons come from the Realm of Fire, even though none know how to get there. It is said to be a land wholly different from our own. There is no road that will take you there, no great body of water on which you can sail to its shores. Legend says the only way to get there is through fire. Who in the burnt realm knows what that means? Surely I did not, but I was soon to find out and it would lead to a journey I will never forget. The day I found the great robes of the old wizard everyone had stopped believing in was the day my fate changed forever. As this year draws on and I turn 31 I want it to be the year I publish my first novel length work. 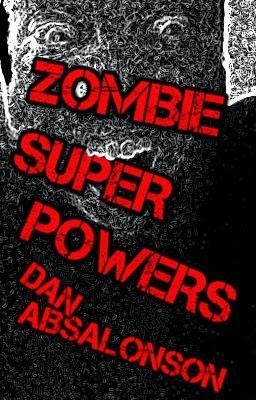 The novel I'm currently writing, Zombie Super Powers, is the best one I've written so far and I'm hopeful it's the one. Now I just need to finish it so I can get it in the hands of beta readers and then to an editor. I'm excited. 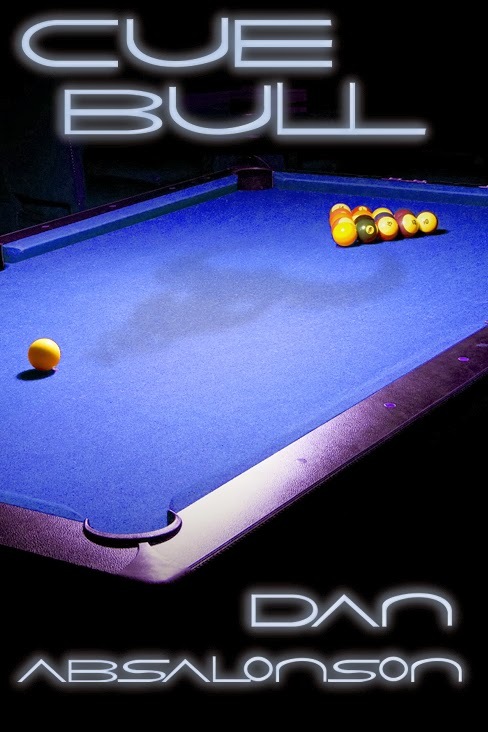 If you want to read along with me as I'm writing it and be an Alpha reader you can do so for free over at Wattpad. It's super easy to leave comments there to, you don't even have to be a member. They have great reading apps for all your devices as well. Other than that I still have the novella Sword and Urn that I had edited by two people which needs a major revision and the edits put in. Once I'm done with my novel I'll get cracking on that so I can whip it into a publishable shape. With any luck I should be publishing a novel and a novella this year. That would be awesome. Thanks for stopping by everybody. Though it's just begun, I hope 2014 is shaping up to be a great year for you all! 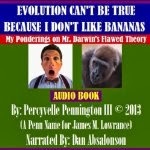 This hilarious and very tongue in cheek book I narrated is now available at Audible, Amazon, and in iTunes! I had way too much fun with this one. I hope to do more humorous books in the future as the delivery and timing required in the narration on them is a really fun challenge. The next two book to hit digital bookshelves are actually humorous books as well. Look for posts about them soon. While the solution I offer to the growing problem of restaurant patrons blowing their noses outwardly and openly within public dining rooms, is simple and that I could have easily stated within a single paragraph, this would be a lost opportunity. I say this because my example and solution for only one problem we may experience during our stay at a public eatery, is simply that..."an example". I am using what might be the single most disgusting behavioral act that can be perpetrated but not hidden, by a fellow restaurant-patron, being that of "dining room nose blowing". 3. "Restaurant Boogie Fever" - One of the Rudeness Biggies! I hope you'll give it a listen. If anything listen to the sample for a laugh. Maybe it will convince you to pick the book up. It's a great price for an audiobook. Thanks for stopping by! 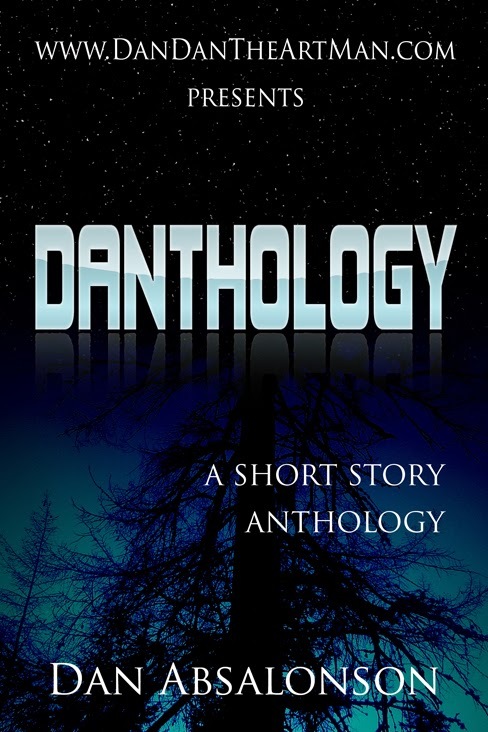 This is the cover for the short story I'm currently writing. Hopefully it will be accepted by the Every Photo Tells duo and they'll podcast it beautifully. It was inspired by their November photo. Okay, now back to writing it! Thanks for stopping by.